That’s so SAD! It looks gorgeous there! Did you use an inside structural cone? I was told by a professional caterer that if you are making a large croquembouche to always use an inside structural cone if you plan on transporting it. The mere act of moving the structure can shift the weight of the structure, and if the humidity is especially high or a single creampuff collapses it can cause the rest of the structure to collapse. Using a styrofoam inside form is the safety net! Get a large form, wrap it in parchment paper of wax paper, and then use toothpicks to pin the creampuffs to form. That way if one puff collapses or goes wayward, the rest of the creampuffs should stay put. SO sorry about this mishap! Thank you!! 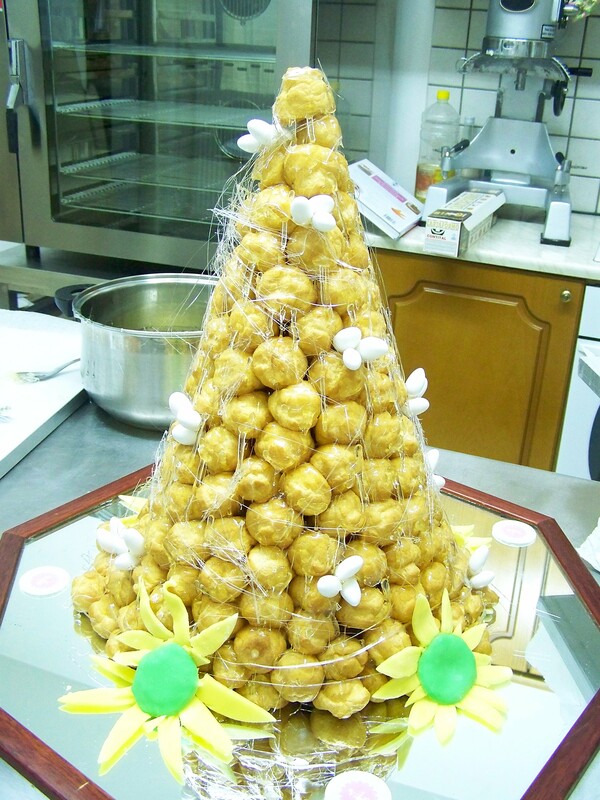 I used a cone as a mold to make the croquembouche by mounting it upside down inside out if you know what I mean. I let it set a bit and turned the cone over onto the plater and gently removed the cone and wax paper that was snuggly wrapped around it. It all went well. What I did realize afterwards, is that there wasn’t nearly as much caramel at the base as there was at the top half of the pyramid. Since I started with the top, and ended with the bottom, as my caramel was finishing and thickening, by the time I got to my last rows I was using too little to secure them well. I think in the end that’s what made the pyramid less sturdy at the bottom and created the collapse. I also didn’t use any caramel on the plater to secure the whole structure. Live and learn.. right?! At least I know better for next time. To work with 2 maybe even 3 pans of caramel making sure I get enough all around from top to bottom, and to mount it on the spot. I could transport the filled cone but I think mounting it on the spot remains an essential part. Thanks again for your kind words, I really appreciate it!